The BROKER PRE-LICENSING COURSE is the first step toward starting your real estate career. The course consists of 75 hours of instruction required for qualification to take the course real estate license examination. Topics include: basic real estate practices and principles, real estate law, financing, brokerage, contracts, closings and other topics. Upon completion of the course you may apply to sit for the N.C. Licensing Exam to receive your state license. Our course will give you the best possible preparation for this exam. Want to find out the requirements for obtaining a license? Click to view this video provided by the North Carolina Real Estate Commission. Come join Kim Stotesbury for a weekday course starting on June 13th through Auguest 17th from 9am - 4pm. NOTE: The first day of class June 13th will be held at LaQuinta hotel, 2020 Griffith Road, W-S NC 27103 (next to Village Tavern on Stratford Rd). Register by paying an initial deposit. The balance will be due by the first day of class. Pay the remaining balance if you previously registered with a deposit. Come join Julie Campbell for a weekday course starting on July 9th through September 12th from 9am - 1pm. Come join Kathy Casa for a weekend course starting on July 27th through September 1st from 9:00am - 5:00pm. Come join Julie Campbell for a weekday course starting on September 19th through December 5th from 9am - 1pm. Come join Julie Campbell for an evening course starting on September 24th through December 3rd from 5:30pm - 8:30pm. 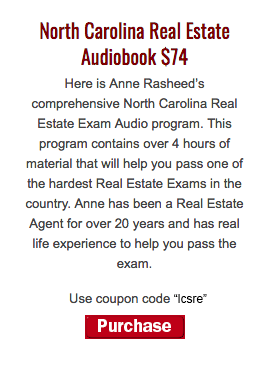 We have just partnered with NC Real Estate Exam and are able to offer you Anne Rasheed's $99 4 Hour Comprehensive Audiobook for $74! Simply put in coupon code LCSRE and you will receive $25 off the purchase price. This is an instant download that you can stream from your mobile device, or download to your computer. Please call Lane at 336-391-2910 or email Lane at lyoung@carolinaschoolre.com to make arrangements to pick up your textbook. What are the license qualifications requirements? License qualification requirements are provided on p4 of Real Estate Licensing in NC (RELINC). What are the fees associated with getting a license? Prelicense course registration fee, application fee, exam registration fee, & criminal background check. For details, see pages 4-12 of RELINC. Can I take the Broker Prelicense course online? No. Currently, the broker Prelicense course is only offered in live classroom format. A list of approved schools is available on the Commission's website. Where can I buy the Prelicense textbook? Contact your school to determine which book will be used and if tuition includes a textbook. Can I apply for my license online? Yes, if you are applying for a broker license. Click here to access the Commission's online application system. Applications for Firm Licenses and Limited Nonresident Commercial Licenses must be submitted via paper forms. Visit the Forms page of the Commission’s website to download the paper application forms. I lost my application username and password. Help! The username should be your email address & you can choose to “reset password”. Also, you may contact the Commission for assistance. How do I obtain my criminal record report? Contact Criminal Record Check.com at 877.272.0266 or www.ncreccheck.com . Criminal Record Check (CRC) is the only approved criminal record provider for the NC Real Estate Commission. Reports from other agencies will not be accepted. How much will the criminal record report cost? If you have only lived in NC during the past 7 years, your report will likely cost less than $30. However, you must submit a criminal record report for any state or country in which you lived during the past 7 years. Fees are assessed for each state and/or country. Also, checks must be performed for all names and aliases. Read more on pp 11-12 of RELINC. I ran a criminal background check a year ago. Do I need to order a new report? Yes, you need to order a new report. Only a report prepared by CRC within the previous six months is acceptable. See p11 of RELINC. I took (and passed!) the Prelicense course last year. May I apply now or do I need to retake the class? You may apply now. You do not need to retake the course at this point. The Broker Prelicense course must have been successfully completed within 3 years prior to application. See p5 of RELINC. What is a certificate of license history? A license history is an official document published by the real estate governing agency in the state you hold a license. It is not a wall license pocket card or certificate. It shows the type of license you hold, how you received your license, the duration of your license, your status, and any disciplinary actions. How soon after I submit my application will I be able to take the licensing exam? Assuming the Commission determines you meet the qualification requirements and have submitted a complete application, you will be sent a “Notice of Exam Eligibility” that will enable you to register for the licensing exam. If you filed an online application, the notice should be sent to you via email within 3-4 business days of receipt of your application. If you filed a paper application, it will be sent via US mail within 7-10 business days of receipt. Read more on p24 of RELINC. How do I schedule my exam? 1 business day following receipt of the Exam Eligibility Notice, you may schedule your exam with PSI/AMP online or by phone.See pgs 24-26 of RELINC. Once I get a Notice of Exam Eligibility, how long do I have to take the exam? The Exam Eligibility period is 180 days. If you do not take &/or pass the exam within that period, you must re-apply. See p24 of RELINC. See pp 13-23 of RELINC for details regarding exam format & content. How long is the licensing exam? The exam is 4 hours & includes 150 questions, of which 100 are National and 40 are State-based questions. The remaining 10 questions are unscored, pretest questions. See p23 of RELINC for details. How many times can I take the exam in my 180-day eligibility? Applicants are not allowed to retake the licensing exam for at least 10 calendar days following a failed or missed exam. Other than that waiting period, there is no limit to the number of attempts during the 180-day eligibility period. Refer to pgs 24-30 of RELINC. If I pass the National section but not the State in the 180-day exam eligibility period, will I have to take the entire exam again? It depends. If you pass only one section and are applying to retest within the same 180-period, you need only take the portion that you did not pass. However, if you have exceeded 180 days, you must reapply and take the entire exam (both sections) again. You must pass both sections within the same 180-day period. See pg 30 of RELINC. How can I request a special accommodation to take the exam? A candidate requesting special accommodations must call PSI/AMP (800-367-1565, ext. 6750) to schedule the exam. Refer to page 25 of RELINC. What is the “character review” process? All applicants must successfully complete the Broker Prelicense course (unless exempt), submit an application (with appropriate fee and background check), and pass the licensing exam. At this point, the Commission will evaluate any character issues that were disclosed on the application or background report. Every application is considered individually. If character issues were reported, the application is first evaluated by the License Application Analyst and Executive Director. If necessary, the application may be then referred to the Commission for review at the next monthly Commission meeting. The Commission may make a decision regarding licensure at that meeting or may choose to invite an applicant to the Commission office for a “character conference” the following month. An applicant will be notified in writing of the Commission’s decision. I want to teach the Prelicense course in North Carolina. What are the qualification requirements and how do I apply? NCAC 58H.0302 explains the criteria and procedures for Commission approval of Pre/Postlicensing and Update instructors. The "Real Estate Prelicensing, Postlicensing, or Update Instructor Application for original approval (Form REC 3.76)" is available on the Commission's website under Forms.